There has been widespread protest by Oromo students in universities in Ethiopia against unpopular 'Addis Ababa-Finfinnee surrounding integrated master plan'. Oromo students in Haromaya, Jimma, Ambo and Wollega universities held protests. Although officials in Oromia state and Addis Ababa city administration insist the plan only intends to develop Addis Ababa and its surrounding, Oromo students and the wider Oromo elites believe the plan is to displace farmers in the outskirts and suburban areas of the city, meet the growing demand for land, and weaken the Oromo identity. The Ethiopian constitution grants a special interest to the Oromia state regarding administrative, resource and other socio-economic matters in Addis Ababa, in its article 49 which never have been implemented. This has largely resulted in significant resistance within the ruling party, OPDO, in Oromia and a continues pressure to materialize the implementation. The protest against the doomed to fail master plan is held in four universities sofar. Yesterday (26/04/2014) at Wollega University, the infamous and notorious Federal police opened fire at innocent Oromo students. Reports and eye witness indicate unknown number of students were hurt and some have fled to the bushes. The people of Nekemete town were prevented from joining the resistance. Even then some of the residents broke through line of federal police force and joined the protest. 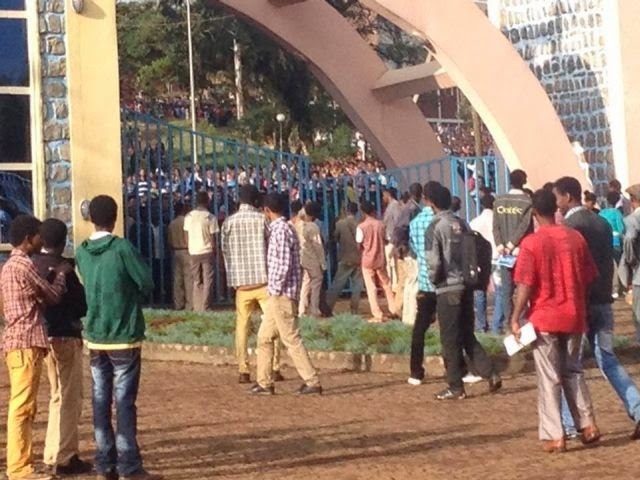 At similar protest in Jimma university, the security forces picked more than 10 students and jailed them. Further 15 students in Ambo university were jailed. The security forces in Ethiopia are dominated by the Tigrayan minority who have been in power since the downfall of Derg communist regime in 1991. The Oromos are the most prosecuted in Ethiopia. More than 40000 Oromos are in jail, although the correct figure is hard to know.